- Enzymetherapy ®, COLOR HOLD is clinically proven to provide 10 times the intensity of the color and better coverage of white hair. Even after 28 days. The color is bright and intense as the first application. 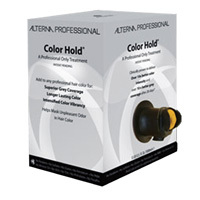 COLOR HOLD ® can be added to any percentage of gray to cover exceptional, intense shine and to preserve the color longer. From the natural endpoint, the results of unparalleled color, prolong the intensity of the color and prevent color fading after each wash.
- Helps to mask the unpleasant smell of the color.